Seen in parades carrying "The Colours" and performing the Musket Drill of the 18th Century originals at various ceremonial occaisions, Fort Fraser's "Honourable Guard" is always an audience favourite. The uniform is historically authentic, and the Kilt shows the Regimental Tartan seen at the Battles for Quebec in 1759, and 1760. The 78th Fraser Highlanders wore both the great kilt (feileadh mor) and the little kilt (feileadh beag). They wore a short red coat with buff facings, and red and white diced hose. Blue balmorals with bearskin hackles were issued. Sporrans and dirks were not issued, and reflected the soldier's wealth. of the 78th as they appeared during The Seven Years War. 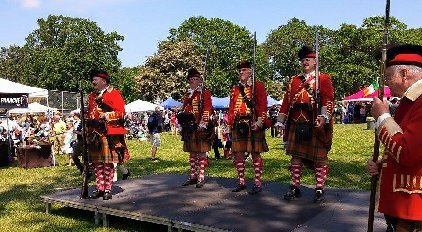 78th Highland Regiment was raised under Royal Warrant in January, 1757 by Simon Fraser, Master of Lovat, specifically for service in the North American arena of The Seven Years War, known to many as the French and Indian War. The Regiment known as Fraser's Highlanders, distinguished itself in several key actions, among them the Seige of Louisbourg, both Battles of the Plains of Abraham, at the taking of Montreal and the recovery of Newfoundland. In December 1763, the 78th was disbanded as hostilities ceased. Many officers and soldiers opted to remain in Canada on land grants received in recognition of their service to both Kings George II and III. The 78th Fraser Highlanders were officially reconstituted in 1966 in Montreal and the Display Unit performed at Expo 67, where they were inspected by her Majesty Queen Elizabeth II for the first time. (c) 2015 78th Fraser Highlanders Fort Fraser Garrison, 1st Signal Corps.